Click here for more stories by Sarah Ash. Alchymist’s Legacy — (2008-2009) This series is a prequel to The Tears of Artamon. The kingdom of Francia has purged its magi. But when a young Guerrier rescues an orphaned street waif, little does he know that she is the daughter of a magus who met his end on their pyres — or that she is guarded by an aethyric spirit — and driven by the name of the traitor who condemned her father to flames. With the gift of song infused within her, the child’s voice will bring her before the most powerful heads of state. And she will craft herself into a weapon… aimed at the heart of the man she despises. From the alchymist’s apprentice whose discovery leads him into a dark partnership, to a girl who will become the toast of three nations, a new magic will grant powers and ignite dangers beyond all reckoning. 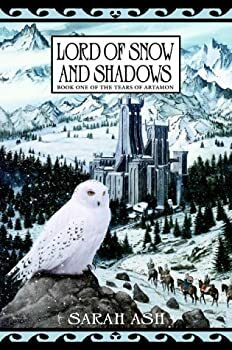 A timeless tale of adventure, battle, and beauty, this dazzling story spans the realm of the human and the immortal, the schemes of the power hungry, the dreams of lovers and the resurrection of the fallen in one magnificent, epic fantasy. Moths to a Flame — (1995) Publisher: Wondrous Myh-Dhiel, home to the dynasty of the House of Memizhon, a place of gothic-Byzantine riches and opulence — but now corrupt and subject to a king and queen, the Arkhan and his Arkhys, slowly going mad inside their labyrinthine palace. But in this stagnant land nothing can shake the powers that be — until the arrival of two young slaves, twins Lai and Laili. Lai, the man of peace, must become a warrior, or die in the Arena; chaste Laili suffers as the Arkhan’s new concubine. Forced into submission and betrayal of principle, they nevertheless survive. And, once enmeshed in the court and its machinery of power, they rise to new prominence. But Myn-Shiel must change… And as the power-playing of the court reaches fever pitch, a god-driven plague — complex, disguising itself as an irresistible drug — descends. Now Lai and Laili must realise their true fate — destroyers and redeemers both. For these are the last days. And this is the fall of the house of Memizhon. Songspinners — (1996) Publisher: ‘The gift is not a perfect gift. It carryes the curse of madness with it… the Songspinners live a short intense life, gladdening all with their unique talents before their genius is brutally extinguished…’ Orial is tormented by strange dreams, by sounds others do not hear. She escapes to her mother’s tomb, losing herself in singing to Iridial’s memory. What she does not know is that her hidden talent may be her undoing. When Orial becomes the scribe to a composer whose injured hands cannot write, she takes the first steps on the road to madness and war. For in Orial’s world music is a tool for rebellion and dissent and the notes she transcribes are the battle hymn of a people. The Lost Child — (1998) Publisher: Rahab finds the bloodless corpse of a child on his ghetto doorstep, the victim of a ritual murder. The Tsyonim, barely tolerated at the best of times, are now the subject of suspicion and hatred in Arcassanne. And the captain of the city guard is determined to ensure that it is a ghetto dweller who is found responsible for the murder. As his people prepare to flee once more from persecution, Rahab is determined to find th real killer — to prove his own innocence, and to atone for letting go of hsi brother’s hand as they fled their birthplace in the last pogrom. Salvation lies unexpectedly close at hand, but is more terrifying, and more spectacular, than Rehab could ever have imagined.